As an an avid reader that I am, I mostly like books which, when I reach their quarter, made me say "It will irrevocably change me”. Simone de Beauvoir's autobiography - "Memoirs of a dutiful daughter" - is an example and the second book in the hierarchy of those which have ravaged me like a hurricane - a brilliant, beautiful, unexpected one and, frankly, for a long time expected.. It's the kind of book you live for, you dream of. I was waiting for it. Her style of writing is with absolutely no imperfection: flawless in every sense of the word. How she writes struck me: I knew nothing about it and had no expectations; I expected to recognize myself, hidden by rows, but not to such an extent. The book is an autobiography of a girl who is anything but dutiful. Simone wants to destroy all the icons in front of which she was forced to pray by the conformism of her acquaintances. Her childhood, adolescence and university years are presented in a unique way. The book made me shudder and I felt like I have found a sister, a ”doppelgänger” of mine in the twentieth century. I had a comforting feeling after finding out (having, perhaps, an early intuition of this fact) that there was someone who experienced everything I felt and I am feeling. Apparently, I talk too much about how impressed I was instead of depicting the book itself. But I have already did that: it is, indeed, an autobiography that shall seem boring to those reading YA books or the latest works of the contemporary writers. This one owns a heartbreaking depth, it let you wracked in front of your soul and all you can do is to question each idea, moral value, faith. The end of the book annoyed me so much; it seemed too tedious for such a masterpiece. 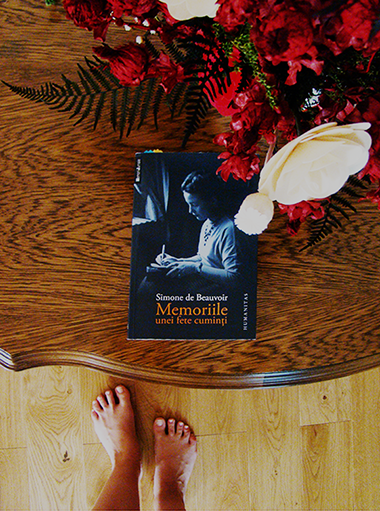 I hated Beauvoir - but only for a moment – for such an epilogue and for being so elusive regarding Sartre – I was expecting his arrival the entire novel. In any case, for me, this book became, after nearly half of the pages, a bedside book, a Bible of writing, of feelings, of self-discovery. I recommend it only to those who do not read everything that falls in their hand.